To what extent the various individuals referred to in the messages were involved with Soviet intelligence is a topic of historical dispute. While a number of academics and historians assert that most of the individuals mentioned in the Venona decrypts were most likely either clandestine assets and/or contacts of Soviet intelligence agents, others argue that many of those people probably had no malicious intentions and committed no crimes. Controversy arose in 2009 over the Texas State Board of Education's revision of their high school history class curricula to suggest Venona shows Senator Joseph McCarthy to have been justified in his zeal in exposing those whom he believed to be Soviet spies or communist sympathizers. Critics assert most people and organizations identified by McCarthy were not mentioned in the Venona content and that his accusations remain largely unsupported by evidence. Confirmation about espionage work came from the Venona project, which intercepted and decrypted Soviet intelligence reports sent during and after World War II. These provided clues to the identity of several spies at Los Alamos and elsewhere, some of whom have never been identified. Some of this information was available to the government during the 1950s trials, but it was not usable in court as it was highly classified. Additionally, historians have found that records from Soviet archives, which were briefly opened to researchers after the fall of the Soviet Union, included more information about some spies. Bella Joseph was the wife of Julius Joseph. The couple worked for the United States Government. It is alleged that they also worked for Soviet Intelligence during World War II, Bella in the Office of Strategic Services' Motion Picture Division. Her alleged cover name in Soviet intelligence, and as deciphered in the Venona project, is "Colleague". Bella is also identified as "Colleague" in Weinstein and Vassiliev's, The Haunted Wood, a book based on Soviet archives..
Francia Yakilnilna Mitynen aka Edna Margaret Patterson was a Soviet citizen born in Australia. Mitynen was an illegal officer of the Naval GRU who was smuggled into the United States in August 1943. Mitynen worked under the name Edna Patterson until she left America in 1956. Edward Joseph Fitzgerald was an American who worked for the War Production Board during World War II and was an adviser to Senator Claude Pepper. He was alleged to have been a member of the Perlo group of Soviet spies. Fitzgerald's name in Venona project decrypt 588 New York to Moscow, 29 April 1944, was sent in the clear to Moscow by Soviet Case Officer Iskhak Akhmerov reporting on Elizabeth Bentley's meeting with Perlo group. The Silvermaster File of the United States' Federal Bureau of Investigation is a 162-volume compendium of some 26,000 pages of documents relating to the Bureau's investigation of Communist penetration of the U.S. federal government during the Cold War. Beginning in 1945 with the allegations of defecting Soviet courier Elizabeth Bentley (Venona cover names “Myrna”; Umnitsa, “Clever Girl”), the file is also known as the Bentley file or Gregory file ("Gregory" was the FBI code name for Bentley). The file takes its name from Nathan Gregory Silvermaster (Venona cover names Pel, Pal, "Paul"; "Robert") of the War Production Board, whom Bentley named as head of an underground Communist network known as the Silvermaster Group. Among the people named in the file in connection with this group are President Franklin Roosevelt's Administrative Assistant Lauchlin Currie (Venona cover name "Page") and Assistant Secretary of the Treasury Harry Dexter White (Venona cover names “Lawyer”; “Jurist”; "Richard"). Also named in the file are Victor Perlo (Venona cover name "Raider"), chief of the Aviation Section of the War Production Board, and contacts of his Perlo group, including Alger Hiss (Venona cover name “Ales”), secretary general of the United Nations Charter Conference. (Like several others identified by Bentley, Hiss had been identified independently by another defecting Soviet courier, Whittaker Chambers, to Assistant Secretary of State Adolf Berle in 1939.) Among dozens of others named by Bentley in this file in connection with this network is Duncan Lee (Venona cover name “Koch”), confidential assistant to William Donovan, founder and director of the Office of Strategic Services (OSS), wartime predecessor of the CIA. Gene Grabeel (June 5, 1920 – January 30, 2015) was an American mathematician and cryptanalyst who founded the Venona project. Genevieve Marie Grotjan Feinstein (April 30, 1913 – August 10, 2006) was an American mathematician and cryptanalyst. 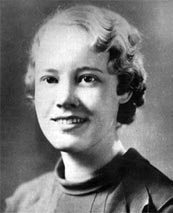 She worked for the Signals Intelligence Service throughout World War II, during which time she played an important role in deciphering the Japanese cryptography machine Purple, and later worked on the Cold War-era Venona project. Hede Massing, née "Hedwig Tune" (also "Hede Eisler," "Hede Gumperz," and "Redhead") (6 January 1900 – 8 March 1981), was an Austrian actress in Vienna and Berlin, communist, and Soviet intelligence operative in Europe and the United States during the 1930s and 1940s. After World War II, she defected from the Soviet underground. She came to prominence by testifying in the second case of Alger Hiss in 1949; later, she published accounts about the underground. Ignacy Witczak was a GRU Illegal officer in the United States during World War II. Witczak's code name with the GRU and as deciphered by the Venona project and other counterintelligence investigations was "R". He operated under a cover of a student and then instructor at the University of Southern California in Los Angeles in the 1940s.Shortly after the defection on 5 September 1945 of Igor Gouzenko, a GRU code clerk at the Soviet embassy in Ottawa, Samuel Witczak, an instructor at the University of Southern California, disappeared from a beach in Southern California, never to be seen again. Later his wife disappeared as well. In a 1952 Senate report, he was identified as a Soviet spy; his name had surfaced in the Venona decrypts. The FBI search for Witczak is described in the memoirs of FBI special agent Robert Lamphere. The FBI had learned Witczak had entered the United States from Canada on a false passport and suspected Witczak was not his true name. Later the FBI was able to trace some of Witczak's former agents, but never learned what happened to him. Enemy Amongst Trojans tells the rest of the story.Recent document releases in Britain and Russia, one showing Kim Philby reported on him, identify Witczak as “Litvin” and explain what happened to him after returning to the Soviet Union. Litvin's GRU career ended during a purge of Jews, but he survived that, later becoming a translator of American books on intelligence. Joseph Katz (1912—2004) worked for Soviet intelligence from the 1930s to the late 1940s as one of its most active liaison agents. Katz was assigned management of the "First Line," that part of the NKGB mission aimed at recruiting selected members of the Communist Party USA. He was an agent/group leader (gruppovik) and co-owner of a Soviet front company that manufactured gloves. The Venona project suggests he may have been implicated, along with Amadeo Sabatini, in the murder of Walter Krivitsky in 1941. After the death of Jacob Golos in November 1943, spotting and recruitment was taken over by Katz by mid–1944, while Elizabeth Bentley continued as manager and courier. Katz was extremely active at this time. Katz was known to Elizabeth Bentley as "Jack." In 1944 Katz was put in charge of handling agent recruitments from the New York City TASS office headed by Vladimir Pravdin, former rezident of the NKGB in New York. And in September 1944 Katz was freed of other liaisons (operations) and was assigned to work directly under Washington D.C. Rezident Anatoli Gromov. Gromov came to the United States to implement a new security program of isolating agents from each other by a complicated arrangement of cutouts. Katz and Bentley's operations in New York and Washington were very extensive. Bentley would eventually name more than 80 individuals who were providing information to the Soviet intelligence from a dozen government institutions. Katz informed Bentley at their first meeting in October 1944 that Gromov had been sent to the United States to improve security of NKGB operations. One aspect of this modernization was to have Bentley turn over to NKGB control all of her agents not previously surrendered to NKGB officers. After Bentley's defection Katz was assigned the task of killing her. Anatoly Gorsky sent a memorandum to Moscow about Elizabeth Bentley. (11) Allen Weinstein has pointed out: "Gorsky discussed and rejected in his November 27 memo a variety of options: shooting Bentley (too noisy), arranging a car or subway accident (too risky), and faking a suicide (too chancy). In connection with the last option, Gorsky noted that he had selected agent "X" (Joseph Katz) for the task of eliminating Bentley... In the end, Gorsky decided that a slow-acting poison should be administered to Bentley, something "X" could place on a pillow or handkerchief or in her food." Gorsky warned NKVD headquarters that Joseph Katz was not in good health and that Bentley might cause him problems as she was "a very strong, tall and healthy woman, and "X" was not feeling well lately". Eventually Gorsky was told that: "No measures should be taken with regard to (Bentley)." Gorsky was informed that it had been decided that Lavrentiy Beria would deal with Bentley. However, on 16 August 1947, Katz met the NKVD station chief in Paris to discuss the elimination of Bentley. It was reported that Katz was willing to take the assignment but at the last minute it was decided to abandon the idea.Katz moved to Western Europe to form a company for covering the illegal courier line between Europe and U.S. Katz lived in France from 1948 to 1951 then moved to Israel. His code names in the Venona project are "X" and "Informer". Kitty Harris (25 May 1899 – 1966) was a Soviet secret agent and "long-time special courier of the OGPU-NKVD foreign intelligence during the 1930s and 1940s." Harris was identified only in 2001 when her code name "Ada" or "Aida" was found in declassified files from the Venona Project. This was a counterintelligence program initiated by the United States Army's Signal Intelligence Service (later the National Security Agency) that ran from February 1, 1943 until October 1, 1980. The following list of Americans in the Venona papers is a list of names deciphered from codenames contained in the Venona project, an American government effort from 1943–1980 to decrypt coded messages by intelligence forces of the Soviet Union. To what extent some of the individuals named in the Venona papers were actually involved with Soviet intelligence is a topic of dispute. The following list of individuals is extracted in large part from the work of historians John Earl Haynes and Harvey Klehr and reflects their previous points of view. However, Haynes' positions on the meaning and correct identification of names on the list continues to evolve. Non-Americans may also be mentioned in passing. Martin David Kamen (August 27, 1913, Toronto – August 31, 2002) was a chemist briefly involved with the Manhattan project. Together with Sam Ruben, he co-discovered the synthesis of the isotope carbon-14 on February 27, 1940, at the University of California Radiation Laboratory, Berkeley. Meredith Knox Gardner (October 20, 1912 – August 9, 2002) was an American linguist and codebreaker. Gardner worked in counter-intelligence, decoding Soviet intelligence traffic regarding espionage in the United States, in what came to be known as the Venona project. Michael S. Leshing was an American citizen and the Superintendent of Twentieth Century Fox film laboratories in the 1940s. He was awarded an Oscar in 1945 for Technical Achievement for his work in color film processing. Leshing was also linked to a covert relationship with Soviet intelligence during World War II. In 1943, a Venona project decryption reported that he provided the KGB's Technical Line intelligence documents and a formula for color motion pictures and other film-processing technology. 512 KGB San Francisco to Moscow, 7 December 1943. The Office of the Coordinator of Inter-American Affairs, later known as the Office for Inter-American Affairs, was a United States agency promoting inter-American cooperation (Pan-Americanism) during the 1940s, especially in commercial and economic areas. It was started in August 1940 as OCCCRBAR (Office for Coordination of Commercial and Cultural Relations between the American Republics) with Nelson Rockefeller as its head, appointed by President Franklin Delano Roosevelt.The Office of Coordinator of Inter-American Affairs in the Executive Office of the President was formally established and enacted by US Executive Order 8840 on July 30, 1941 by President Roosevelt who named Nelson Rockefeller as the Coordinator of Inter-American Affairs (CIAA). The agency's function was to distribute news, films and advertising, and to broadcast radio, in and to Latin America in order to counter Italian and German propaganda there. The OCIAA grew to be a large Federal agency with a budget of $38 million by 1942 and 1,500 employees by 1943. It was later renamed the Office of Inter-American Affairs (OIAA) with slightly changed powers by Executive order 9532 on March 23, 1945. Headed by Victor Perlo, the Perlo group is the name given to a group of Americans who provided information which was given to Soviet intelligence agencies; it was active during the World War II period, until the entire group was exposed to the FBI by the defection of Elizabeth Bentley.It had sources on the War Production Board, the Senate La Follette Subcommittee on Civil Liberties; and in the United States Department of Treasury. Richard Treadwell Hallock (5 April 1906 in Passaic, New Jersey – 20 November 1980 in Chicago) was an American Assyriologist and Elamitologist. He reached his Ph.D. degree in Assyriology at the University of Chicago in 1935, and was editorial secretary of the Chicago Assyrian Dictionary (1955–1957). His major work is Persepolis Fortification Tablets (1969), the first edition and translation of the Persepolis Fortification Archive. In 1972, he was elected a corresponding fellow of the British Academy. Hallock also played an instrumental role in the Venona project. While working on Soviet "Trade" traffic (so named because these messages dealt with Soviet trade issues), Hallock discovered that the Soviets were reusing pages of some of the one-time pads they relied upon to encrypt their messages. Hallock and his colleagues (including Genevieve Feinstein, Cecil Phillips, Frank Lewis, Frank Wanat, and Lucille Campbell) went on to break into a significant amount of trade traffic, recovering many one-time pad additive key tables in the process.